Diageo has struck a multimillion-dollar advertising deal with Facebook, which will lead to the two companies sharing skills and resources and the appointment of Diageo's CMO to the social network's client council. The drinks company will work closely with a team from Facebook to drive customer engagement and boost its brands, including Guinness and Smirnoff, which already have 12.6 million fans across the site. The deal will include early access to forthcoming features and consultancy to push and improve social campaigns. 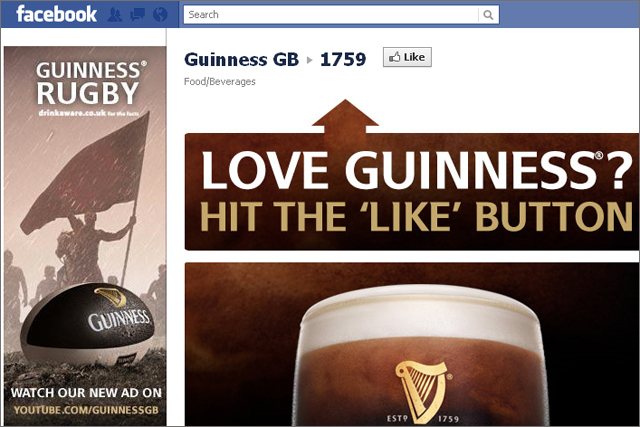 Facebook will be working with Diageo's key brands in New York, London and Amsterdam. Diageo will also target emerging markets such as Brazil and Singapore, where Facebook has established local teams as part of the deal. Facebook will work with the company's roster of agencies from concept development through to campaign execution. As part of the deal, Andy Fennell, chief marketing officer at Diageo is joining Facebook's "client council", the consultation scheme announced in June. Members already include Wendy Clark, senior-vice president, integrated marketing communication and capabilities at Coca-Cola. Fennell said: "We are already seeing real value from our work in this space. "Over 950 Diageo marketers around the world have now been trained in Facebook boot camps to build their social media capabilities and we are seeing significant returns on investment across a number of brands. "We expect this new way of working to deliver even more commercial value for Diageo." Diageo already has a track record in creating Facebook-centric marketing campaigns, with Facebook forming a hub for its recent Nightlife Exchange Project. Facebook already offers similar services to P&G and Walmart. Earlier this year, (25 January) rival drinks company Bacardi announced plans to shift 90% of its digital spend to Facebook over the next two years, as it no longer deems dotcom sites relevant.